On friday I finished my contribution to the HandmadeKultur sewing contest. To take part you had to do a tunic dress after a pattern that was in August’s issue of the magazine. 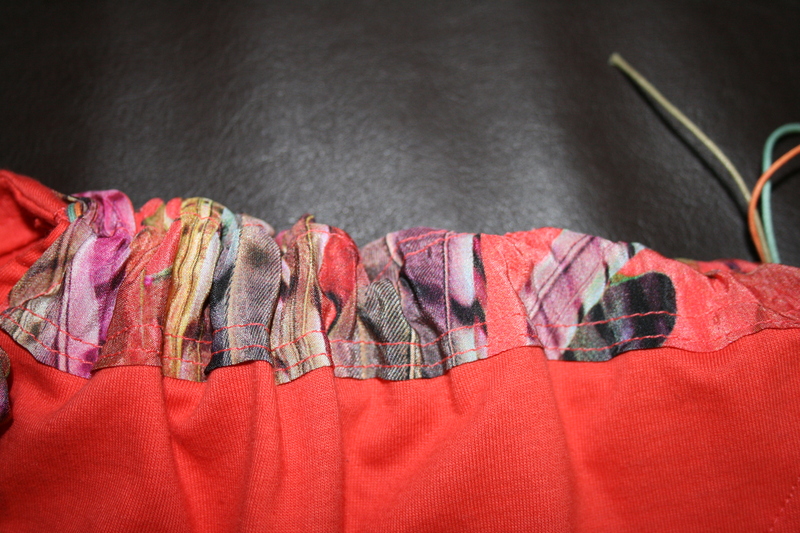 I used some coral coloured jersey that I had bought in May and had not yet used. Unfortunately I had a little too less cloth so I had to adapt the pattern a bit to fit it on the cloth (which meant that it got a little bit tighter but as it is quite loose anyway it was not a problem). 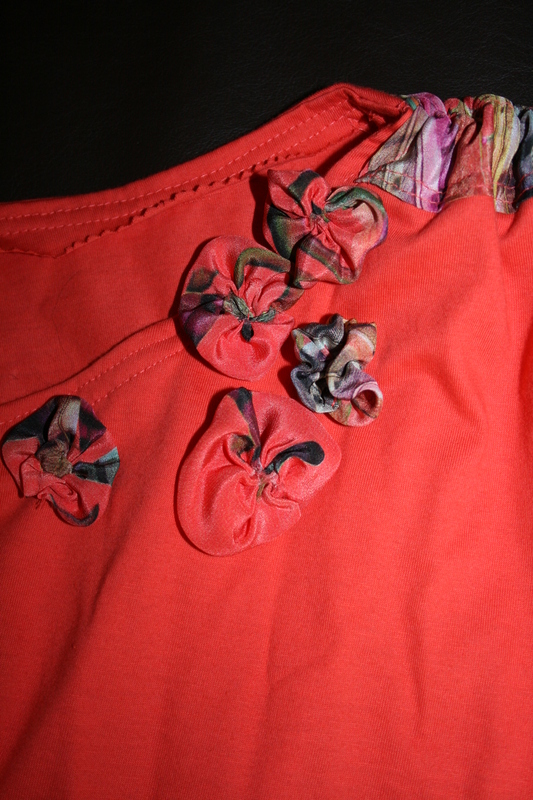 For the details I used a printed silk that matched the colour of the jersey. I liked the pattern but except from the fact that that would have been far to expensive it would have been overwhelming anyway. 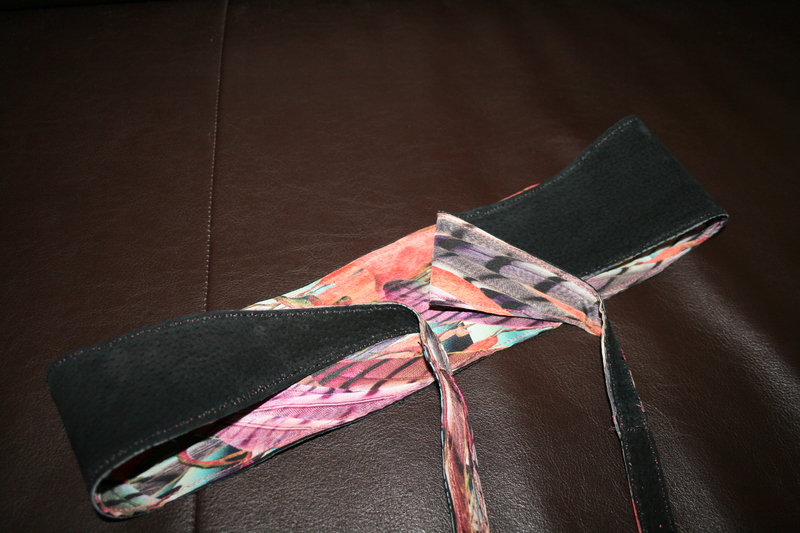 Sewing the material was easy and I serged the seams with pinking shears. On the shoulders the dress was supposed to have inlying tunnels to fit the sleeves. I changed the pattern a bit and made onlying tunnels from the silk. That was in general not that hard to do but as the silk is very silky, I had to sew it by hand first before I stiched it on the sleeve with my sewing machine. Unfortunately I cut the cloth near the neckline. So I had to come up with an idea to cover that. This is why I made small flowers from the silk. It was pretty easy. You just take some leftover cloth pieces, fold it and stich it together by hand on one side and than just draw the thread and voilá, there is the flower. Then its just about closing the petal. At with my dress I stiched five of them next to the neckline. They are so easy to make and very decorative, I think I make s few more for my Dawanda Shop. Now I only had to think about how to make a belt for the dress (because without on I looked like put into a coral coloured sack). I took an old one, that I had bought in Australia five years back and that was falling apart. The backside in black fake suede was reusable and I stiches the silk on it by hand first before I fixed it with the machine. All of that took a little bit longer than the 3 hours that the magazine said, but which took the most time were my additions to the dress. So I hope you like it and vote for me at the contest.